The press is neurotically trying to attribute every minor fluctuation in share price to something that just happened somewhere, and it is annoying to say the least. If you know anything about the markets, you know that 99% of the time they are reacting to something that will occur five or six months out into the future. Of course if the folks on Bloomberg had to make some intelligent comments on what could possibly be coming six months down the road, the air waves would be filled with a lot of silence. The financial news networks’ devoted most of the week debating whether or not the Irish will agree to a bailout and as of the close of business on Friday no decision had been reached. The Irish want the money but without the pain, and why not. We had a whole decade of free money with little or no regard as to whether it was being used for productive purposes. The EU wants the Irish to take the money along with all the Draconian strings attached to it, and the Irish are balking. Meanwhile the Greeks took money but failed to implement all the changes they had previously agreed to. Then we have the Portuguese, Spanish and Italians all heading down the same road and they are watching carefully to see just how bad it will be. I would love to have a ring side seat when the EU tries to implement change in Italy. I’ve lived in Italy for a number of years and change is about as welcome as a blow to the head from a baseball bat! I’ll have to admit that I was quite surprised to see Greece’s placement between Brazil and China on this chart. I would have imagined that that would have been down at the other end of the scale. China of course will refrain from buying and draw down on their food stocks but that will only work for so long. Once they go back into the market, prices will move higher again. 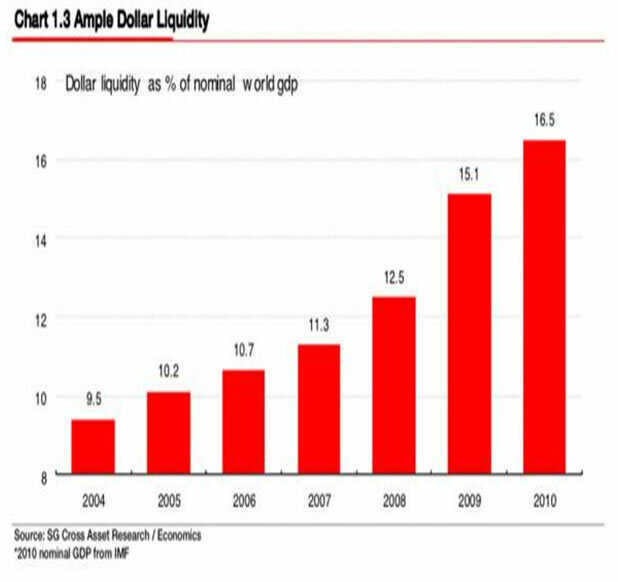 world with liquidity, and like a cesspool the level is rising as you can see in the preceding chart. I suppose this would be acceptable in some possible world if quantitative easing produced positive results. When QE1 was proposed the Fed boasted that it would liquefy the banks and they would begin to loan. Unemployment would decline as companies invested and the need for workers would increase. Also, the Fed would buy bonds and force the interest rate down. Now the Fed has dialed in QE2 because the banks loaded up with cash but never loaned, unemployment went up to 9.6% and never went back down, and interest rates are strangely on the rise! 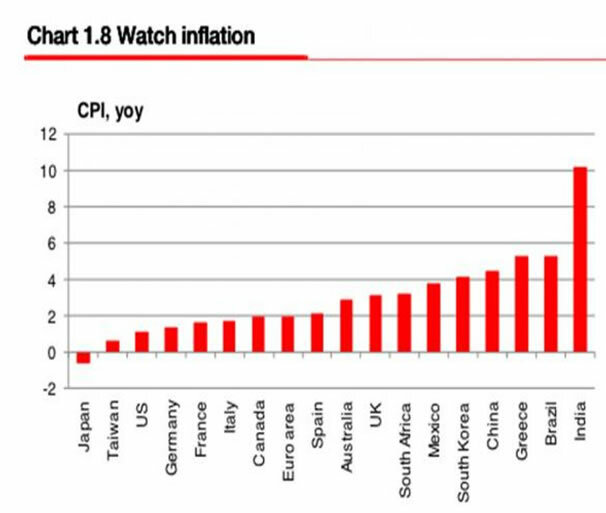 The Fed says it needs QE2 because of the real and present danger of deflation in the United States. Notice the gap down in bonds, and inversely the jump in interest rates, that came right after Bernanke’s announcement regarding QE2! The bond market is sending a clear message saying the perception of risk trumps Fed speak. The Fed has purchased almost US $100 billion in bonds over the last week and yet bond prices continue to fall and rates continue to rise. By telegraphing its intentions to buy US $600 billion in bonds and US $300 in agency debt, the world now knows when it can belly up to the table and dump its dollar denominated debt! I believe that will prove to be a grave miscalculation. This seems to punch a big hole in Mr. Bernanke’s argument but you’ll never get him to admit to that. Of late the US dollar declined from 89.00 to 76.00 as it priced in a significant increase in the quantity of fiat currency coming out of Washington, DC. Then last week people began to openly question if a second round of quantitative easing was really necessary, catching the market off guard and a rally ensued. After bottoming in November 4th at 75.63, the spot US Dollar Index rallied eight days and seems to have topped out at 79.46 and solidly above the 50-dma for the first time in months. You’ll see on Friday that the Index closed out the week at 78.41 and barely above the 50-dma. The dollar is now three days off of the high and the question now is whether or not there is any more upside left. I think Bernanke’s speech put a damper on the possibility of calling off another round of quantitative easing so I doubt we’ll see a test of the neckline and strong resistance at 80.16. The top band of the trend lines that go back to the June high were touched and now the dollar appears to have turned down. RSI and the histogram have also turned down and it looks like MACD is about to do the same so we should see a test of strong support at 77.98 before Thanksgiving. Assuming that that the Fed moves ahead with QE2, we’ll probably see a test of the next critical support level at 75.02 sometime around the end of the month. Finally, at the end of his speech Bernanke on Friday said that the Fed would promote a strong dollar policy and that sums up the contradictions that have come out of Washington over the last couple of decades. Words go one way while actions usually take you in the opposite direction! Rest assured that the dollar will be sacrificed in order to deflate away the US debt. As I mentioned earlier the Fed’s program of quantitative easing has affected a number of markets and that includes the stock market. Fiat currency is backed by nothing and serves no long term productive purpose. It is being generated in massive quantities in order to allow the United States to continue living beyond its means. Since it has no real destination banks either park it back with the Fed earning and interest on something they got for free, or it flows from market to market looking for fast profits. For a long time it flowed into the bond market, housing and into commodities and it also flowed into stocks. The first round of massive quantitative easing, valued at more than US $2 trillion, was announced in March 2009 and it coincided with the bottom in the Dow that came after a massive sell-off causing it to lose close to 65% of its value. A rally resulted that took the Dow from a low of 6,469 all the way back up to significant resistance at 10,729. That level was reached back in January of this year as you can see below. That’s when it was first noticed that QE1 might be running out of gas and the Dow began to trade in a range from 9,600 on the low side to 11,246 on the high side. Now the Fed wants to float QE2 in the hopes of breaking the Dow out to the upside. The chance that QE2 might not come about produced two 90% (where upside volume is 90% of up plus down volume) down days in three sessions and then we had Bernanke’s speech basically saying that it is going to happen. In my opinion the timing of that speech was no accident and now we’ll see if the Fed gets what it wants. I have my doubts! The yield in the S & P 500 is 1.94%, the lowest I can recall in my adult lifetime, while the PER is close to 18 even with all the fraudulent balance sheets floating around out there. These are both extremes and signs of a grossly overvalued market. The number of new 52-week highs has deteriorated from an average of 400 in August to less than 50 this week while the number of new 52-week lows is slowly moving higher. The one thing the bears have in their favor is the fact that big money refuses to enter this market. They have sat on the sidelines as the Dow rallied 75% and they could not be enticed to throw their hat into the ring. Anyone who thinks they’ll jump in at this late stage of the game, with the market clearly overvalued, is relying on “wishes and hopes” rather than focusing on the realities of our present day situation. As far as the here and now is concerned the Dow closed out Friday’s session with a 22 point gain to end the week at 11,203. There is strong resistance at 11,246 and if the Dow can close above it for a second time I could see stocks running as high as 12,266 regardless of whether or not value is in the house. This would mean a 75% recuperation of the bear market decline, the same percentage of recovery that we saw in the bond market, and we’ll more than likely see a test in December. On the other hand, if stocks turn down here, and I think they stand a reasonable chance, then the Dow should be back below 10,000 by Christmas. Watch how the Dow attacks 11,245 this week and we should know the answer by the time everyone carves their turkey! Even gold got caught up in the “to QE2 or not to QE2” debate and that gave us a welcomed reaction that took price from 1,424.00, down to good support at 1,330.00. For some perspective on the reaction, look at the entire move up from the October 2008 low and you’ll see that it doesn’t even make a blip on the chart! The secondary trend was not violated, is headed higher, and both the 50-dma as well as the 200-dma were not broken on a closing bases. I was looking for a seven to nine day decline that would test strong support at 1,318 in the December futures contract. Instead we experienced a six day decline down to decent support at 1,330.30 followed by a bounce. It is not a coincidence that the last decline was also six days in duration although the percentage of decline was somewhat greater this time around (5.2% versus 3.9% during the previous decline). Finally, as you can see the Point % Figure chart remains with a bullish price target of 1,610.00 surpassing my forecast for a 1,447.50 top by a wide margin. I advised my clients on Friday that I was buying gold because I believe the reaction is over and gold will now make another run at the critical 1,447.50 resistance level. I also believe we’ll see that level thoroughly tested and gold will then run up to a minimum of 1,512.00. What happens after that is anybody’s guess. In conclusion, everyone is doing everything they can to sweep all of the problems under the rug. The way I see it the problems are huge and the rug is quite small. The FDIC is a perfect example. On Friday another four banks were taken over bringing the total for the year to 150 banks, and yet we never hear a word about it. What’s worse is that no one talks about the liquidation process used by the FDIC and the fact that these and many other banks grossly overvalued their assets in the first place. The FDIC comes into the failed bank and fixes a value and the assets and guarantees a large percentage of those assigned values for ten years. The institutions that take these banks over have essentially no risk and may even be at risk themselves. Aside from the closings the FDIC also has close to 425 banks operating under serious FDIC enforcement orders that called into question the banks’ solvency. Many of these 425 banks should have been taken over but the FDIC doesn’t want to draw attention to the problem. That’s our government in a nutshell! Supposedly we have a new broom coming into Washington in the form of a new make-up in the Congress and Senate. It seems to be a human failing to pin our hopes on a “savior” to bail out the majority. We did that with Obama, it failed miserably, and it won’t be any different this time around either. Sooner or later people need to realize that progress will only become a reality when the person you see in the mirror at night is a better human being than when he got out of bed that same morning. Institutions whether they are political, educational, social or religious will all fail you because of the general lack of quality found in the average person today. That decline in quality is intentional and a result of government policies implemented over a very long period of time, and designed to produce an ignorant form of human “mule” bred to pull the cart of society for a not so benevolent master. The mule is replaceable, expendable, and his well-being matters not to the master. There is always another mule out there to take his place. That’s the world we face today and it’s my hope that there are still a reasonable number of none mules in the world that can make a difference. It will not be an easy struggle.